This patch is in part a spin-off from my SolinaG2 patch. Phase coherency problems made that patch less playable than I had wished. In the Solina a single-oscillator voice is passed through a chorus ensemble where three parallell delay lines are modulated by LFOs. The effect of this is almost the same as if three parallell oscillators are frequency modulated by LFOs. In the latter example the harmonic structure is more static than if chorus is applied after filtering the signal. On the other hand, the three free running oscillators will have random phase relationships, and thus sound more animated and airy than the phase locked single-oscillator sound typical of Solina and other string machines using divide-down technology. 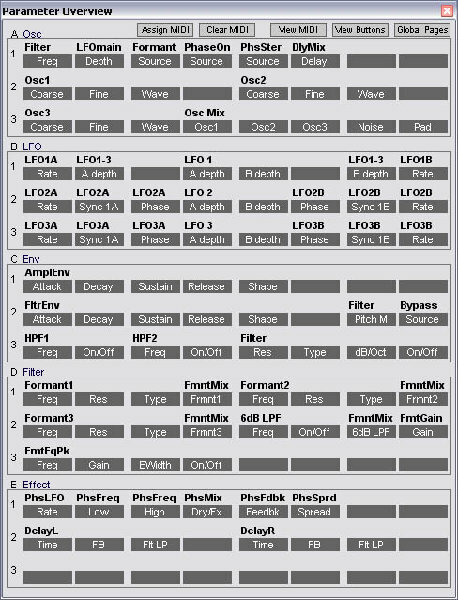 The LFOs are copied (and slightly simplified) from the FX area of my SolinaG2 patch. Each oscillator has a LFO A and LFO B. LFO2A/B and 3A/B can be synchronized to LFO1A/B and the phase of LFO2A/B and 3A/B can be set to 0-360 degrees. By activating LFO sync and setting LFO2 phase to 120 deg and LFO3 phase to 240 deg, the classic Solina chorus can be simulated. 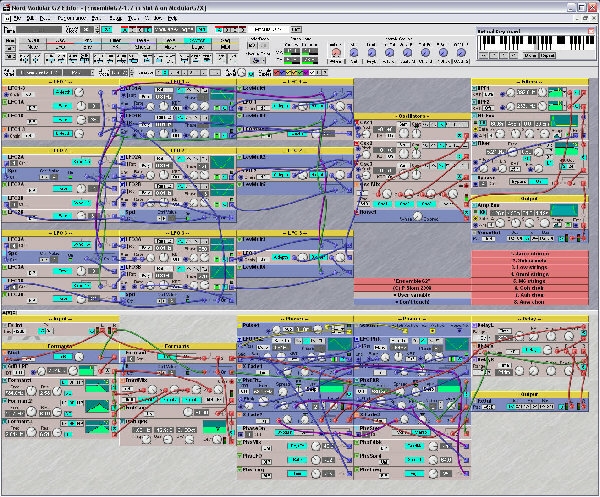 The LFO arrangement in EnsembleG2 is flexible enough to allow other ways of modulation. A lighter modulation effect can be achieved by using just a single LFO per oscillator, analogous to the ARP Omni chorus effect structure. LFO modulation depth is controlled on three levels. A main depth control adjusts all LFOs simultaneously. LFO1-3 A depth and LFO1-3 B depth can be separately controlled. This is useful, for instance, when balancing low and high frequency modulation depth in a Solina-like patch. Finally each oscillator has separate depth controls for LFO A and B. The mod depth controls are multiplicative, i.e. if one is set to minimum, no mod is heard irrespective of the settings of the other controls affecting the same LFO. The oscillator mixer also has a noise input. The purpose of noise in EnsembleG2 is twofold. First, white noise is useful for visualizing filter settings (especially formant filters) with a spectrum analyzer (I use Visual Analyser 10). Second, adding a small amount of noise can make a Mellotron-like sound more authentic. Why so many filters? Well, one HPF, usually with 100 % keytracking, is needed to shape the raw oscillator waveform into something more string-machine-like. Another HPF with lower or no keytracking can be used to further thin out the sound. The Nord filter is usually used as a lowpass filter. By increasing filter resonance and and setting keytracking >0, a keyboard tracking formant can be generated. The core of the formant filters (three parallell resonant filters) is taken from g2ian's VP-330 choir patch. I've added a few extra elements. The stereo phaser consists of a pair of Filter Phase modulated by a pair of synchronized LFOs with 90 deg phase shift. A simple demo recording of EnsembleG2. Wow! another jewel for the archive, thanks! Hey, you have an Engine and a G2X!